It seems like New Year’s was only days ago, but it’s already February and that means Valentine’s Day is fast approaching. 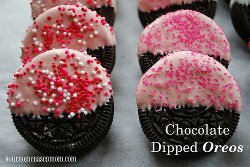 We have dedicated this eCookbook to Valentine’s Day desserts so whether you’re planning a romantic evening for two, or looking for a fun recipe to make with the kids, you will find it here. We have assembled some of our staff’s favorite dessert recipes, including cake and pie recipes, mousses, cupcake recipes, drinks and other Valentine’s Day dessert recipes. We have everything from Chocolate Cherry Cake and Perfect Tiramisu to Flourless Chocolate Cake and Orange Scented Hot Chocolate, plus lots more. The recipes in this collection are fun and easy, and all of them are delicious. Make one or make several, and your Valentine’s Day is sure to have a sweet ending. Want even more sweets for your sweet? Check out our collection of 11 Cute Desserts for Valentine's Day. Whether your significant other likes chocolate desserts, cake, cookies or anything in between, this round-up has what you're looking for. Plus, browse our complete collection of recipes for Valentine's Day!